Now that the dust from Toronto’s birthday parties has settled, it’s time to consider what happens next. Every day this week, Futurist offers a glimpse of the Toronto that is to come. As the first decade of the twenty-first century comes to a close, Toronto is approaching a critical juncture, replete with equal parts optimism and economic fright. Regardless, it seems certain that the city will continue to grow in the near future, with developments a-plenty on the horizon. According to projections by Statistics Canada, Toronto’s population will hit nearly 2.6 million by 2011, a jump of 5 percent from 2006; the growth rate for the GTA as a whole outstrips that by nearly two-to-one, rocketing to 6.26 million, a 9.2 percent change from 2006. As the area’s population grows, the number of people reporting themselves to be part of a visible minority will surpasses the number of Caucasians for the first time, with a total of between 2.6 million and 3.2 million—46.9 to 51 percent of the GTA—projected for 2011. While Toronto’s population continues to swell, the ongoing recession will put the municipal government into a financial corner leading into 2010. TD Bank economist Derek Burleton predicts that unemployment will rise to about 9.5 percent from 7.5 percent in 2008, with skyrocketing welfare costs potentially adding sixty-five to seventy million dollars to the city’s spending, further putting the screws to the already shaky municipal budget. 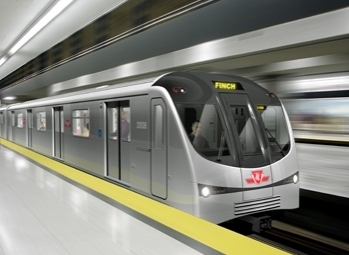 Artist’s conception of the new TTC rolling stock. Image by the TTC. Assuming financial pressures don’t force City Hall to delay its transit plans, a number of key TTC upgrades are expected to take place by the end of 2010. New subway rolling stock will start to be phased in on the Yonge-University line, with 234 cars delivered before the end of 2011. Above ground, all streetcars and buses will be fitted with GPS by the end of 2009, allowing for the implementation of an expanded Next Vehicle Information System (already in place for the subway system by the end of 2009). A pair of new transit lines will be on the way to completion, with construction of the Queens Quay and Sheppard East LRT lines well underway. Local transit will also be greening up its act in the next couple of years. 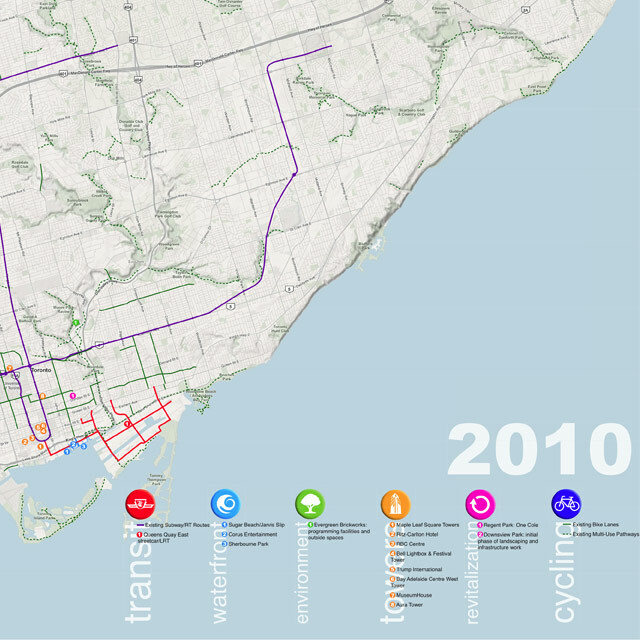 By 2010 all TTC buses will be fitted with bike racks and bicycle storage spaces will be available at stations across the GO Transit network; forty-five percent of Toronto’s bus fleet will be hybrids; and eighty percent of TTC waste will be diverted from landfills. The end of this decade will see Toronto as a whole become more environmentally friendly as well, with several City Hall projects leading the way to increased waste reduction and sustainability. The most prominent of these initiatives is the municipal government’s goal to divert seventy percent of the city’s garbage from landfills by the close of 2010, a date coinciding with the end of Toronto’s contract with the Carlton Farms Landfill in Michigan. As part of its efforts to meet the seventy percent diversion goal, a five-cent-a-bag charge will be levied on plastic bags citywide starting on June 1, 2009. The city will also implement two key environmental programs in the near future: the Toronto Green Standard, which City Hall describes as “a set of performance measures for sustainable development that responds to the City’s environmental concerns,” will be implemented in September 2009; and a bylaw requiring businesses and the municipal government to disclose their use of twenty-five hazardous chemicals will come into effect at the beginning of 2010. Absolute World South and Aura Tower. Renderings by Fernbrook Homes and Canderel Stoneridge Equity Group Inc.
As in years past, development will be a key issue in 2010 and beyond, with a number of new monoliths making their mark on the city’s skyline. Foremost among these are the seventy-five-storey Aura Tower, located at the corner of Yonge Street and Gerrard Street, which will take the mantle of Canada’s largest condominium tower upon its completion in late 2010; the fifty-nine-storey Trump International Hotel and Tower, a suitably grandiose piece of architecture from the icon of greed (and bad hair) himself, currently under construction at the corner of Bay Street and Adelaide Street; and the fifty-three storey Ritz Carlton Hotel, located on the south side of Wellington Street near John Street. Other new high-rises of note include Festival Tower—which will be joined at the hip with the Bell Lightbox, the new home of the Toronto International Film Festival—and several LEED–certified developments, including RBC Centre, Maple Leaf Square, Bay-Adelaide Centre West Tower, and MuseumHouse. 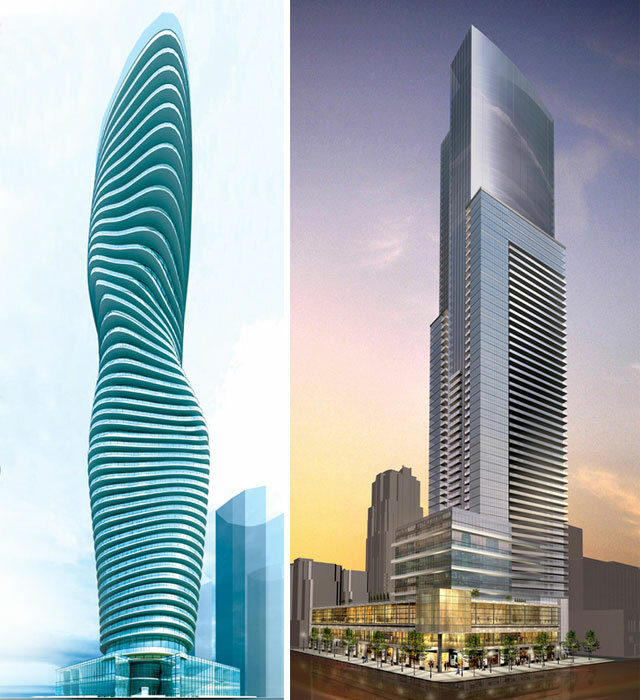 Mississauga will also get in on the sky-scraping action, with the fifty-six storey, 360-degree rotating, and totally curvaceous Absolute World South scheduled for completion in 2010. On a less luxurious but equally important note, tenants will soon be able to move into Regent Park’s 293-unit Cole One condo, as well as a number of smaller residences in the newly reinvigorated neighbourhood. On the shore of Lake Ontario, the ongoing waterfront revitalization will continue with abandon. The 3.6 acre Sherbourne Park will open to the public, as will Sugar Beach (formerly Jarvis Slip), so named for the half-century-old Redpath Sugar Refinery located just a stone’s throw away. The Corus Building, a five hundred thousand square foot office and broadcast complex, will open nearby at One Waterfront Place (located at the foot of Jarvis Street). Artist’s conception of Sugar Beach, formerly Jarvis Slip. Image by Claude Cormier Landscape Architects. Further east, construction of the Don River Park will be well underway, as will the building of the waterfront trail and major improvements to Downsview Park. While Toronto’s parks system grows, so will the presence of urban agriculture. The Toronto Urban Farm (a.k.a. Black Creek Urban Farm) in the Jane-Finch area will continue to expand, and new projects such as the Evergreen Brickworks and the Cultivation Campus in Downsview Park will give more Torontonians the chance to connect with agriculture in their own backyard. On the educational front, several municipally owned museums will be reconfigured in 2010. Renovations to Montgomery’s Inn will begin, as will improvements to Spadina House. Both projects will expand the museums’ focus from a single time period to different periods in the buildings’ histories. As the city’s museums expand, so will Ryerson University, which will break ground on its new Student Learning Centre on the former site of Sam the Record Man, and commence its re-do of the School of Image Arts building. Meanwhile, another local educational institution—the Toronto District School Board—plans to shutter up to three schools, the first stage in a series of closures intended to increase efficiency. Given how poorly students and their parents took plans to shut down school pools, expect spirited protests once specific closures are announced. Provincial cabinet minister and potential mayoral candidate George Smitherman. Photo by Jared Purdy. The myriad changes taking place across Toronto in the next two years will be plentiful fodder for the candidates in the November 2010 municipal election, when Mayor David Miller will defend his record against an as-yet undetermined line-up of his detractors. 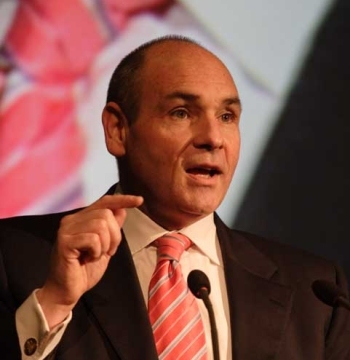 The most likely contenders so far are Provincial Minister of Energy and Infrastructure (and first openly gay MPP) George Smitherman, along with right-wing agitator (blowhard, if you will) Councillor Rob Ford. No doubt a few other less prominent figures will step into the ring, but the real question is whether Toronto Argonauts CEO and local football hero Mike “Pinball” Clemons will decide that now is the time to start his much-speculated-about political career. We think not, but, to put it mildly, stranger things have happened. The economic turbulence that continues to grip the world will be a defining force heading into 2010, and could potentially throw any number of the above-mentioned plans off the rails. Even so, the city could end up with a much rosier outlook than expected, especially if Toronto’s bid for the 2015 Pan American Games comes out on top later this year, spurring infrastructure investment at a critical economic time. Of course, despite being an early favourite for the event, we could still see it fall through our fingers, leading to a now-familiar deluge of self-recrimination. But even if the worst-case scenario becomes reality—either with the games or any of the other challenges facing the city in the coming months—Toronto is already planning for what lies beyond. Research compiled by Hamutal Dotan, Jerad Gallinger, Stephen Michalowicz, and Kevin Plummer. “Toronto in 2010” master map created by Brenda Petroff. The original version of the lead map that accompanied this post didn’t include about a dozen bike lanes that were completed throughout 2008, and several more that were approved by Council recently and are slated for installation in the near future, including those lanes on Wellesley Street (from Queen’s Park Crescent to Parliament Street), Rogers Road (from Old Weston Road to Oakwood Avenue), and Renforth Drive (from Bloor Street West to Rathburn Road). A full list of the lanes we omitted are in this memo sent to the Cycling Advisory Committee—but not on the City’s own 2008 cycling map, which was what we initially consulted for this article, and which is missing all new bike lanes constructed since…well, we’re not sure, because there’s no mention of when the city’s map is current to. Our map, though, is now updated.